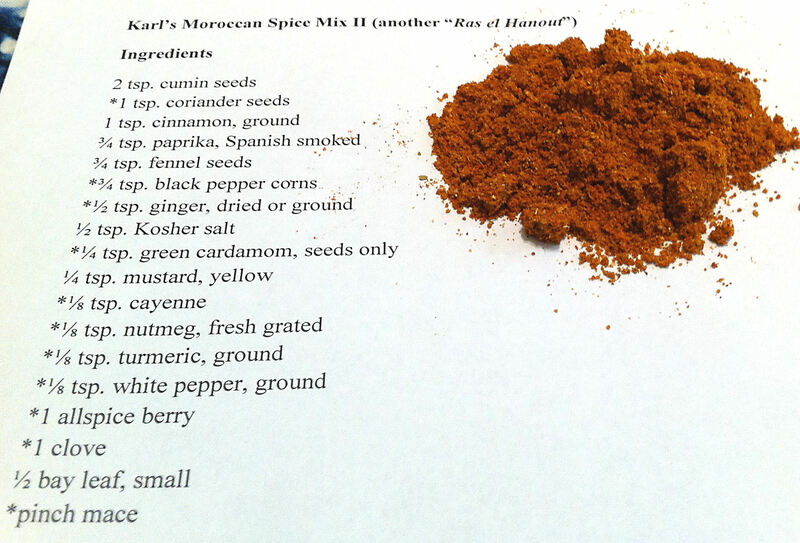 I have made the Moroccan spice blend Ras el Hanout before. For this Father’s Day, I wanted a Moroccan blend that was just a little bit simpler than 29 ingredients. Looking at my old recipe, I cut out the more obscure spices and adjusted the quantities. To be called a Ras el Hanout the blend should have at least these eleven spices: allspice, black pepper, cardamom, cayenne pepper, cloves, coriander seeds, ginger, mace, nutmeg, turmeric, and white pepper. The quantities of each spice vary widely between blends I have found. Note: Although I have seen recipes on-line with fewer ingredients claiming the name, I would only call them a Moroccan blend of spices. After this basic recipe, additions seem to be pretty much anything in the spice shop that strikes your fancy. I found Ras el Hanout recipes that included: Anise seeds, ajowan seeds, bay leaves, Birdseye Chili Peppers, black (brown) cardamom pods, caraway seeds, cubeb pepper, dill seeds, fennel seeds, galangal, grains of paradise, kalajeera (black cumin), lavender, long pepper, monk’s pepper, mustard seeds (yellow), nigella, oregano, orris root, paprika (hot, smoky, or sweet), rose petals (red & pink), rosebuds, saffron, salt, sugar, thyme, and za’atar (which is a blend itself). Actually, to reach the reputed fifty to one hundred ingredients of some of the authentic recipes, it really may be everything in the spice shop—including such exotics as Spanish fly, which is actually a beetle. The secret, of course, is in how much of each ingredient. Everyone—who is not a Moroccan spice merchant—is only guessing at what the secret recipes are. The only one I found on-line that looks like it might be based on someone’s family recipe was by Habibi on Food.com. It is also the one that had the most ingredients (twenty) of the on-line recipes. Note: Here is a pretty question; can these non-Moroccan blends really call themselves “Ras el Hanout,” since they are not based on the secret recipes that have had generations of tweaking. They may still be tasty Moroccan spice blends, but they are not “head of the shop.” Think sparkling wine vs. “Champaign.” They may still be good combinations of spices, but can they really be called “the best.” This may not be a “true” Ras el Hanout. Jan called this a “Ras el Hanout starter kit. 1. Toast the cumin and coriander seeds in a dry pan for one minute, until fragrant. 2. Measure out all of the ingredients. 3. Put all of the spices in a spice grinder. 4. Process the spices to a fine power. Tip: Use immediately or store in an airtight container.